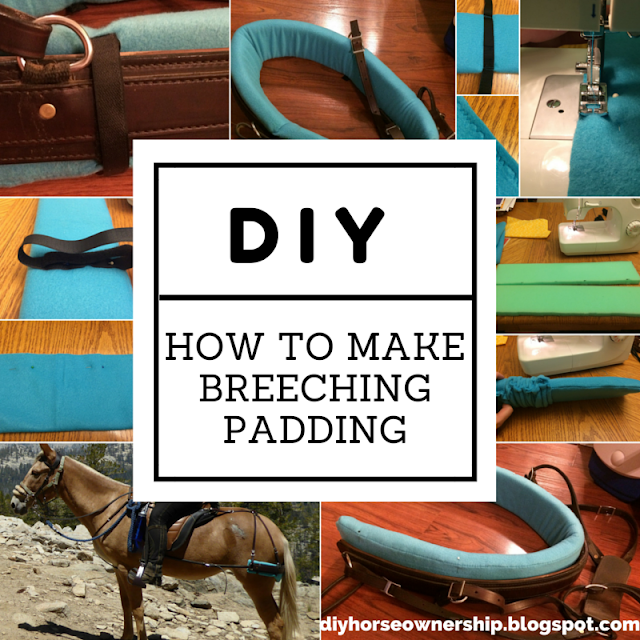 How to make fleece breeching padding for your mule breeching. This would also work for harness breeching. 1. Measure your breeching. Mine is 42″ long and about 3″ wide. 2. You’ll need 1″ thick memory foam, a yard of fleece in your chosen color, and a small bit of scrap fabric (color is irrelevant), thread, pins, sewing machine, tape measurer. 3. I bought remnant foam so I cut 2 pieces 22″ by 4″ wide. You may be able to purchase a solid piece in your full length. You want an extra inch in width and 2 extra inches total in length. 4. Cut your fleece fabric to be your foam’s width x2+1″. So mine was 9″ wide. Length should be length of the foam + 2″. Again, mine was 46″ long. 5. Fold in half lengthwise and pin. 6. Sew the whole edge lengthwise. Keep your edge small. You don’t need more than 1/4″ of fabric past your stitching. 7. I used a zigzag stitch to add some extra strength to the closure. 8. Sew one side closed using the same stitching method. 9. Insert your hand and arm all the way through from the other end and grab the sewn-shut end. 10. Start pulling the edge inside an inch or two to make a pouch. 11. Insert one of your foam pieces into this pouch and grab onto it with the hand inside the fabric. 12. Slowly work the fabric onto the foam. It should be very tight and hard to do. This will keep the fabric from shifting. 13.You want to make sure your seam is lined up along the edge of the foam and not in the middle where it might rub your horse/mule. 14. As you get close to the end of the foam piece, Scoot the rest of the fabric onto the foam, but don’t pull it past your foam piece. Now both your hands are free. The following steps only apply if you have two pieces of foam. If you have only one piece, skip to step 20. 15. Take your small piece of scrap fabric and wrap it around the edge of foam sticking out. 16. Sew the fabric to the foam. Don’t worry about the extra fabric, you can cut it off later. 17. Fold the scrap fabric back. 18. Insert your second piece of foam up tight against the first piece and unfold the fabric. 19. Sew the second piece to the scrap fabric. Now your foam pieces are connected. Cut off the extra fabric. 20. Finish unrolling your fleece over the second foam piece until the entire fleece is right-side-out. 21. Sew your final edge shut by hand so that the seam is tucked inside and the extra fabric isn’t visible. 22. Lay your breeching out on a large flat surface. My table was occupied by the sewing machine, so I used the floor. 23. Use a pin to mark where you are going to attach your velcro. 24. You want to attach the velcro on the inside of each joint so that the fabric won’t shift. Two on each side and one in the middle (no joint at this 5th location). 25. You’ll need 5 pairs of 6″ velcro. Pin each piece on where you placed your pin marker. Make sure the pieces are set up to attach to each other when wrapped around your breeching. 26. Sew each piece of velcro to the edge of the padding. Connect the velcro in the middle. Do this 4 more times. 27. Place the padding inside your breeching again and attach the velcro. I originally only did four velcro straps (I didn’t want one in the middle since it would get manure on it). However, the middle started sagging. It doesn’t touch her at this part, so it’s entirely a cosmetic issue, but a 5th velcro will solve this problem.